* Important Shipping Information: Your Sunfish will come custom packaged in a box designed to keep it safe in transit. 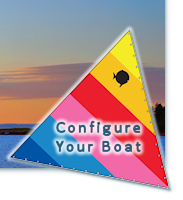 Because the Sunfish sailboat is oversized we currently quote the delivery of each Sunfish on an individual basis. Once you place your order we will contact you to give you details about delivery time. Shipping costs WILL exceed the shipping amount shown in your cart and your order confirmation. Because of the oversized nature of this product, the customer is fully responsible for any shipping costs related to returns as well as a restocking/packaging fee if you choose not to keep your new boat.